Research Professional recently posted an article which gave some insight into who The Wellcome Trust are and what they’re looking for in the applications they receive. To read the full article visit here, for a brief summary read on! They’re the worlds second largest research charity. Most schemes are based on a responsive mode but occasionally there are themed calls available, as well as awards for career development. What makes a good proposal and what are they looking for? Novel, ambitious ideas answering a specific research question. A well thought out team with the knowledge and expertise needed to answer that question. Thinking of applying to Wellcome? You can find what funding is currently available via the Wellcome Trust website. If there is something you’d like to apply for, or simply want to discuss a potential Wellcome proposal then please get in touch with your Research Development Team. Categories: Funder Intelligence and Policy | Tags: charitable funder, Wellcome Trust | Permalink. The British Council and Campus France have come together to offer the Alliance Hubert Curien Programme. This is an opportunity for French and British researchers to work together to strengthen current research projects or strengthen collaborative links for the future. The programme will fund the travel and subsistence of research teams in Britain and France to visit each other with the aim to encourage reciprocal mobility in both countries. Amount: £2,240 (€2,500) available for each partner in each year. The outcome of the application will be received in February 2019 with travel in the first year to take from March in the first year. Applicants must be early career researchers (no more than 10 years post PhD) and must not hold a senior position. For more information about this scheme please visit the British Council Website. If you’d like to apply for this programme please get in touch with your International Development team. Categories: Funding Opportunities | Tags: france, international, Science, travel | Permalink. •Identifying opportunities and risks presented by advancements in digital technology, and practical measures to ensure such technology does not exacerbate socio-economic health inequalities. There is an overarching interest in understanding how to maximise the effectiveness of existing policies so that they can improve the health of the poorest fastest, as well as understanding the reasons why some local areas do well, and some less well, on health inequality measures. Projects may draw on a range of methodologies, which may include, but not limited to: documentary analysis, evidence reviews, secondary analysis of quantitative and qualitative data, and primary data collection e.g. qualitative research with stakeholders and users. If you are interested in this call, please contact your relevant research development manager. £12,000 is available from the Royal Society and an additional £12,000 is awarded by the cost share partner, National Natural Science Foundation of China, to cover both teams international travel and subsistence. £2,000 of the total budget may be used for research expenses or consumables. The Duration of award is 2 years. £12,000 is available from the Royal Society and an additional £12,000 is awarded by the cost share partner, Ministry of Science and Technology of Taiwan or Japan Society for the Promotion of Science, to cover the teams travel expenses for the international visits. £3,000 for 3 months to be spent on travel only. £6,000 for 12 months with £1,000 allowable for consumables. £12,000 for 24 months with £2,000 allowable for consumables. Activities must be based within the natural sciences including: physics, chemistry, mathematics, computer sciences, engineering, agriculture, biological and medical research, geography and experiment psychology. Social sciences, clinical and patient orientated research is not covered by this scheme. Both sets of applicants must hold a PhD or have equivalent research experience and hold a contract at their institution that will extent beyond the project dates. For more information about the schemes please visit the Royal Society website. If you’d like to apply for any of these schemes please contact the Research Development Team. Categories: Funding Opportunities | Tags: Engineering, Geography, international, Royal Society, Science | Permalink. For more details, see website. This year marks the beginning of a new collaboration between Cancer Research UK (CRUK) and the NC3Rs as they offer joint awards to support the sharing of 3Rs skills, tools and technologies within cancer research. The UK continues to lead the way in scientific excellence through the development of pioneering 3Rs technologies and methods. However, concerns about issues such as comparison with historic data or access to specialist skills and/or equipment can mean that researchers are reluctant to take up new 3Rs approaches. To help researchers overcome these barriers and de-risk the adoption of 3Rs methods, NC3Rs and Cancer Research have come together to develeop a new Skills and Knowledge Transfer scheme. This scheme gives researchers the resources they need to implement new 3Rs tools and technologies, the opportunity to learn new career advancing skills to complement their research, and in turn build confidence and capacity in the use of 3Rs approaches. 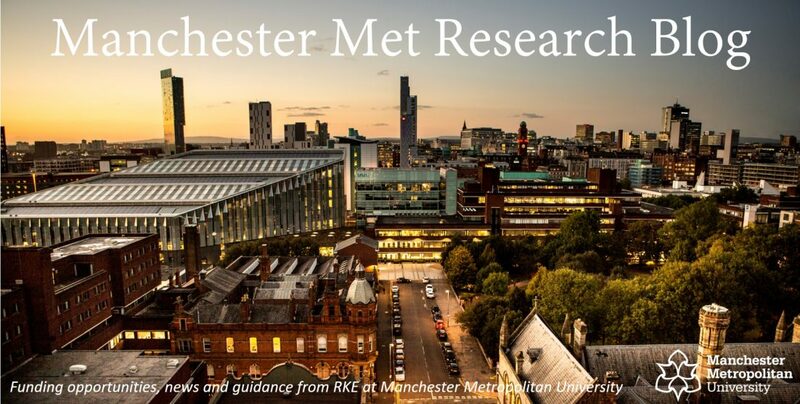 If you would like to discuss this opportunity, please contact your relevant research development officer (k.lavender-smith@mmu.ac.uk). Registration is now OPEN for the NIHR Research Design Service North West (RDS NW), Developing funding proposals in applied health and social care: first grants. The event is for health and social care professionals and researchers in the North West of England who want to develop and submit a funding application. The event is intended for people who are less experienced at applying for research funding and may be considering their first research grant submission. This event is not suitable for anyone who has previously had a research grant. This event will also focus on NHS and Social Care Staff or academic staff working with NHS staff to support them on their first grant. Attending the event will help to make your application stronger and increase your chance of getting your research idea funded. The event will be held on the 11th October, 2018, 9am – 3pm, at The Story Institute, Lancaster, LA1 1TH.